The Municipal Hall of Padre Garcia, Batangas. 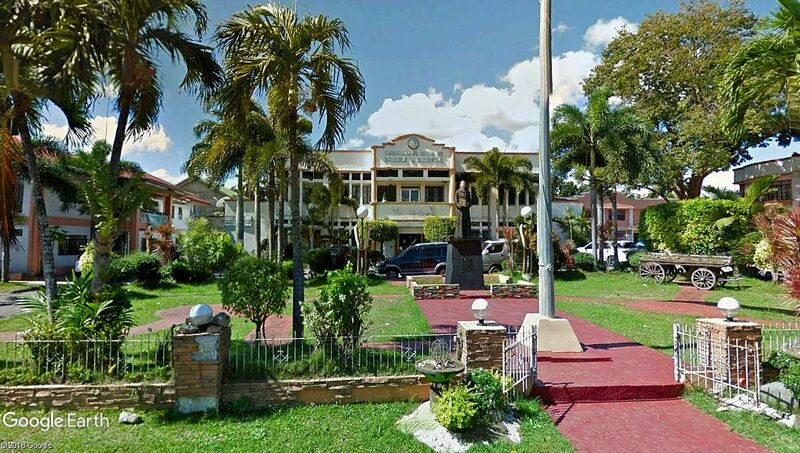 Image source: Google Earth Street View. The Municipality of Padre Garcia used to be the old site of the by-now neighboring town of Rosario until the latter moved to its present-day location after World War II. Then, it used to be called either Lumang Bayan (Old Town) or Sambat. This small town in the present day is often thought of as the livestock capital of the Philippines because of its cattle market, first established in 1952. Padre Garcia formally became a distinct town by virtue of Executive Order 279 signed by then-President Elpidio Quirino in 1949. 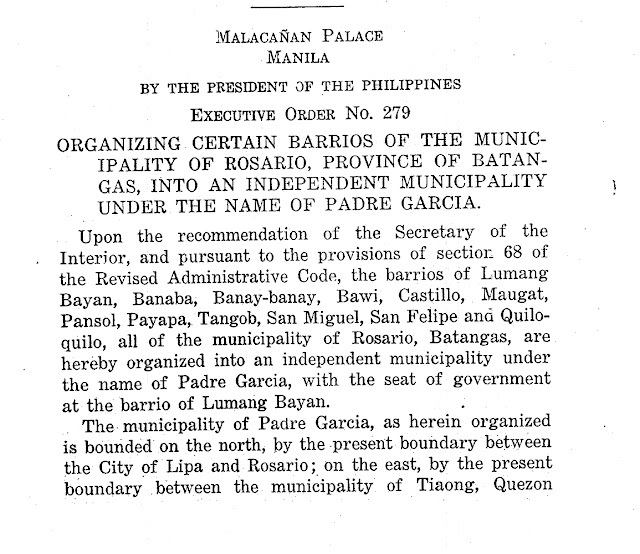 ORGANIZING CERTAIN BARRIOS OF THE MUNICIPALITY OF ROSARIO, PROVINCE OF BATANGAS, INTO AN INDEPENDENT MUNICIPALITY UNDER THE NAME OF PADRE GARCIA. 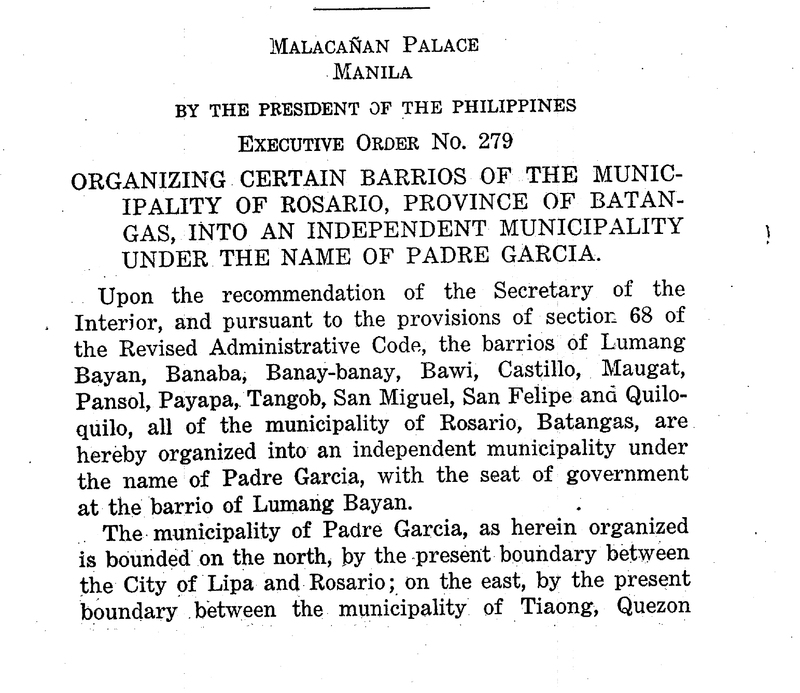 Upon the recommendation of the Secretary of the Interior, and pursuant to the provisions of section 68 of the Revised Administrative Code, the barrios of Lumang Bayan, Banaba, Banay-banay, Bawi, Castillo, Maugat, Pansol, Payapa, Tangob, San Miguel, San Felipe and Quilo-quilo, all of the municipality of Rosario, Batangas, are hereby organized into an independent municipality under the name of Padre Garcia, with the seat of government at the barrio of Lumang Bayan. The municipality of Padre Garcia, as herein organized is bounded on the north, by the present boundary between the City of Lipa and Rosario; on the east, by the present boundary between the municipality of Tiaong, Quezon Province, and Rosario; on the southeast, by the Bayan River from where it crosses the present Batangas-Quezon boundary westward along its south tributary to a point on said tributary exactly north of the poblacion of barrio Tiquiwan, municipality of Rosario; and on the south and southwest, by a line running westward from the said point on the tributary just mentioned to Quiloquilo permanent dam in Quiloquilo Creek; thence to Pinagmuzonan culvert between Lumang bayan and Quilib, Sta. 95—828, 68; thence to Tampayak timber bridge between Sta. Cruz and San Miguel; thence following the course of Tampayak Creek northward to the boundary of Lipa and Rosario. (Description based on map of Rosario, scale 1:40,000, and data submitted by district engineer in his 3rd indorsement, dated May 28, 1948). The municipality of Rosario shall consist of its present territory minus the portion thereof comprised in the municipality of Padre Garcia. The organization herein made shall take effect on December 1, 1949. 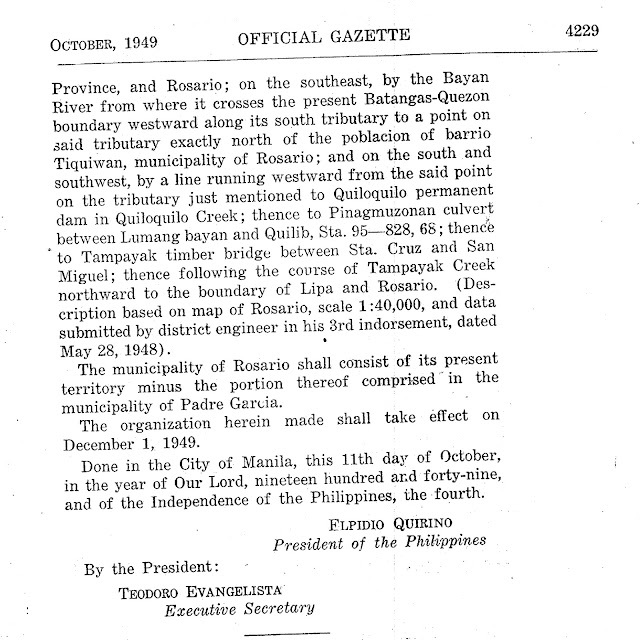 Done in the City of Manila, this 11th day of October, in the year of Our Lord, nineteen hundred and forty-nine, and of the Independence of the Philippines, the fourth.